The Winner of the October Pet Talent Contest is. Congratulations Roxie and Sophie! You are both so precious in your Halloween costumes! Roxie and Sophie have won a free PetsJubilee Pet Sampler box and their picture will be our team store avatar for the month of November. Roxie and Sophie's mom runs the DebDugasDesigns shop on Etsy. Please visit her store for beautiful jewelry. - Voting will be from October 19, 2009 midnight EST through October 25, 2009 at 8:00 pm EST. Wrigley, a yellow lab, in his "ROAR" Alex the lion costume (from the movie Madagascar), handmade in an Etsy shop! He just looks ecstatic to be dressed up, doesn't he? 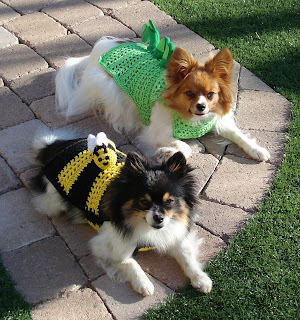 This is Roxie the Bumble Bee ( Pomeranian) and Sophie the Dragon (Papillion) all ready for Dog-O-Ween at our park. All the doggies in our neighborhood get dressed up for the festive occasion and have lots of fun eating treats and playing games. They are sisters, best friends and love each other. I love them too!! 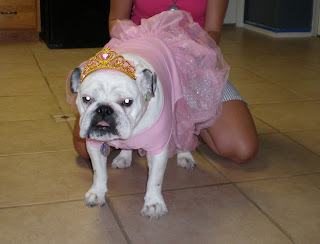 Mia in her Princess Halloween costume. 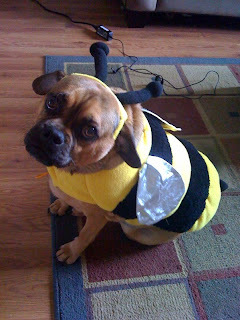 Karsun is a puggle dressed as a bumble bee :) He LOVES to dress up and run around the house in his costumes. 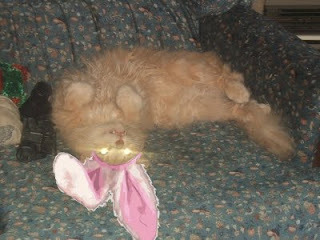 Last year he was a devil and was a very cute devil I must say. This was the first pumpkin the kitties had ever seen, and they didn't know what to think of it. After much sniffing, pawing, and even a little nibbling on the stem, they decided it was an entirely useless object. This picture of Max is one of my favorites because it looks like he is saying, "Here, Mom, you can have this back. It's not good for anything." 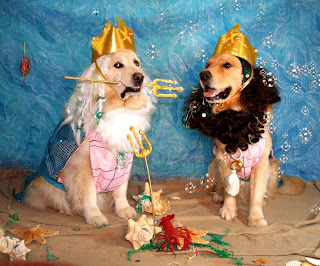 Aladdin and Phoenix are dressed as Kings Poseidon and Triton, the Greek Gods of the Sea. They are mermen, with fish tails and human chests. They have golden tridents they use to control the sea, and have shells and seaweed in their hair and beards. .
My Min Pin Oggie.. being a pretty in pink Princess :O) 4 halloween. We're having a Halloween Pet Photo Contest! Send in your photo, slide show, or video of your pet in a Halloween costume, handmade or store bought. All pets are welcome to enter: dogs, cats, birds, gerbils, hamsters, geckos, chickens, frogs, turtles, snakes, pigs, horses, just to name a few. We'll be accepting entries October 3rd through the 18th. Check out the contest, read the rules (on the right) and join in the fun. Also, stop in on our forum on Etsy to follow along with the entries. Our model is Daisy, the winner of the May contest.